Samhain was scary, but graduation is downright terrifying.Yuki and Emma's recent brush with death has unexpected consequences.Until last winter, Yuki could only smell the dead, but the touch of death's embrace has awakened latent powers. With the help of her friends, Yuki must face her new abilities. Will her psychic powers become the curse they all have feared? Curse or gift, Yuki's new vision begins leading her down an unknown path, but is it a road that only she can follow?Emma's close encounter of the death kind has her questioning her future as well. Until now she had it all--brains, beauty, conviction, fabulous friends, and a scholarship to Tufts Veterinary School. She knew exactly what she wanted and how to get it. Emma had a plan for everything, but she never bargained for her own traitorous emotions. 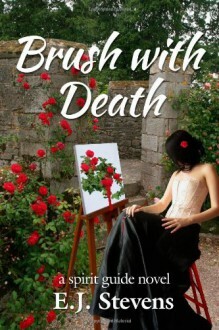 When graduation comes, will Emma follow her dreams...or her heart?Brush with Death is the fourth novel in the young adult Spirit Guide series by E.J. Stevens.